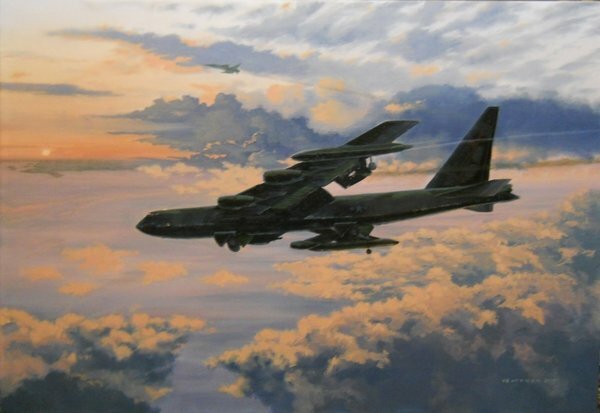 Tuesday, March 11, 2014 Bfrian's painting depicting "Lilac 03", B52D stationed at U-Tapao in 1972 during a Operation Linebacker has been accepted into this years ASAA forum in San Diego. As always it is an honor to be selected in with the nations top artists. Coming to select pieces this year will be Metalography, which is high tech printing on a primed metal surface. Called Deism, it is basically reverse pad printing on the metal which has a brilliant modern look to any art work or photo. The depth and clarity is really something to see, and we will offer these beginning with the Ben Drew piece, "Shooting Swallows" and with "Struggle Home to U-Tapao"